Quite a contrast to Sonam Kapoor’s latest upcoming film, “Veere di wedding” where she plays the role is a spinster figuring out life with her friends and mocking the idea of marriage, she is actually tying the knot with Anand Ahuja. Filled with glamour, glitter, shine and designer outfits, this is surely every girl’s dream wedding. Anand Ahuja was Sonam Kapoor’s boyfriend for quite a long time and they have been showered by many pre-wedding gifts. This dress by Anamika Khanna cannot be ignored. Sonam Kapoor has always shown an inclination towards adorning the designer Anamika Khanna creations. If she longs for a princess or fairytale moment, she could wear a dress like this designed by Akanksha Gajria. This is a dress that is against the typical stereotypes that a bride has to wear red and s a very eye-catching piece. This is another dress designed by Anamika Khanna and is perfect if she wants to go for a simple and pure ivory look on her wedding night. This dress is designed by Shehla Khan and could sweep everyone off their feet with the way Sonam Kapoor could carry it. 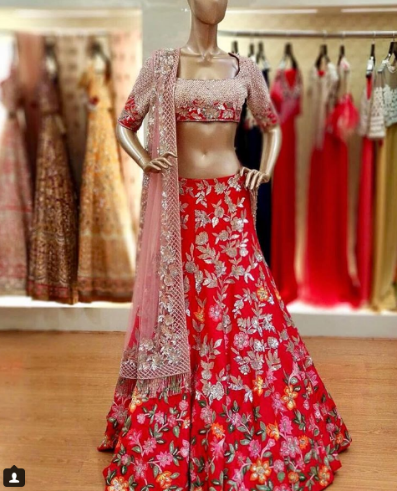 Anita Dongre has stood out once again by designing the piece shown below. 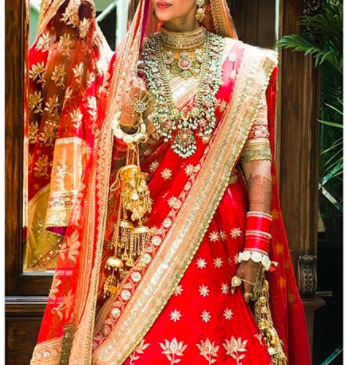 It is something our very bold and beautiful Sonam kapoor could go for if she is looking for a bold look on her wedding day. This is a dress designed by aza fashion and who knows, Sonam might just startle us with a pastel peach. 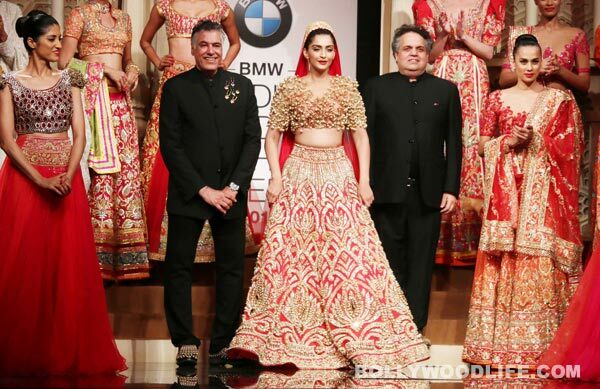 Stay tuned to know the wedding dress colour of Sonam’s outfit! The dress shown below is from Sonam Kapoor’s photoshoot and gives a very ancient and desi look. Let’s wait until tomorrow to know the exact look she adorns on her wedding day. Another dress from her photo shoot is shown below. It is a very glamourous and western outfit. Here is a piece designed by Varun Bahl. Accompanied by bold make up, it could be turned into a bridal outfit. Nothing says bridal more than a red dress. So, here is a piece designed by aza fashions. Sonam will certainly look ravishing in all that she chooses to wear. It is surely going to be an eventful day. The couple seems to have a very special bond and we wish them love and luck on their union together. May love and peace be with them always! « Veere di wedding or Sonam di wedding?